Passionatemae | Food has a way of bringing people together: Cake, Bake and Sweets Show Tickets Giveaway!! It's almost here my dear readers! The Greatest BIGGEST Cake, Bake and Sweets Show is coming to OUR town! It will be held at the Sydney Showground, Olympic Park. This show will be on the 21-23rd March 2014. You can also purchase tickets for the show. Do you love everything cake, sweets?! Are you also a baker? 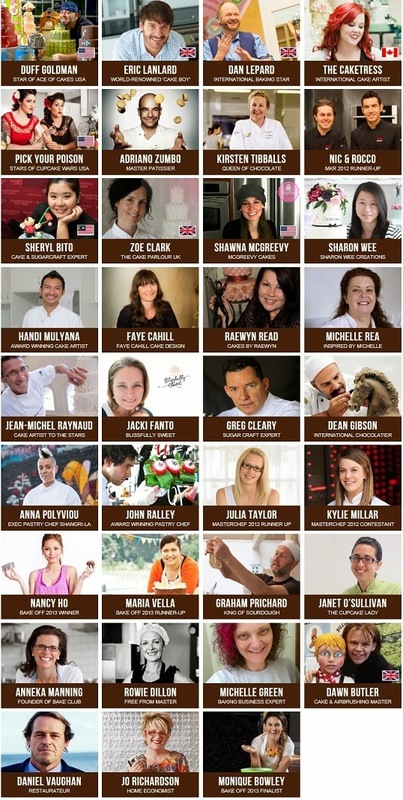 This one-of-a-kind event is packed full of celebrity demos, competitions, classes and interactive workshops. You’ll learn new skills and techniques, get top tips and baking advice, sample and buy tasty treats, stock up on the latest supplies, and have book signings with the stars of baking and much more. It’s a great day out with family and friends! Look at all the celebrities that will be there at the show! Thanks to KJ at National Media, they have been generous to sponsor tickets to one of my lucky readers. So a friend/husband/mum/dad/whoever you want to bring gets to enjoy this experience with you! 1) Tell me why you want to go to the show, who do you want to bring and which day will you be attending in the comment section below? 2) Please email me your postal address and contact details (email/mobile/name), to complete your entry into the draw, so that I can contact you, if you're the winner. 3) Like www.facebook.com/passionatemae if you haven't already. Sunday 16th March 2014 11.59pm (Sydney Eastern time). Winners will be announced and contacted via email on Monday. I would love to come to the show because, come on, it'll be amazing with all colourful cakes and decadent chocolates, right? Plus the brilliant pastry chefs *cough* Adriano Zumbo *cough* I'm bringing my mom as she loves her cakes and baking, and I really don't mind coming on any day! I love baking, and watching Great British Bake-Off (and the Australian version) has inspired me to take baking to the next level – I’d love to learn from the experts! I’d go on the Saturday, and I’d take a fellow baking enthusiast from work. Because Im proud to say that I can and love to eat desserts for breakfast, lunch and dinner. I would love to come to the who because I love making delicious treats for my family and for my sons' birthdays. I want to be inspired to make more! I would bring my chef/foodie friend who is just as enthusiastic about baking and making as I am.